Evelyn T. Lawrence of Marion, VA, whom Pearlsong Press recognized as our "Splendid Senior Among Us" for June 2007, has been featured in a Southwest Virginia Today article by Mary Beth Jackson. The article notes our recognition of Mrs. Lawrence's inspirational nature. Our September 2007 honoree, Edna Love, is also mentioned in the article as helping Mrs. Lawrence set up exhibits at the Mount Pleasant Heritage Museum that was established in 2006. 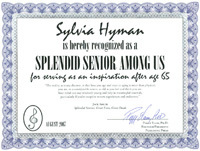 87-year-old Indian Wells, CA resident recognized in “Splendid Seniors Among Us” program honoring people whose post-65 activities can inspire all ages. Lee Stanley doesn’t have any special advice to people who might hope to accomplish as much as he has in his eighth decade. “I follow the beat of my heart,” he says. These days, his heart is beating within monuments he helped raise to commemorate military heroes—including the buddy he lost in combat more than 60 years ago. Stanley’s efforts to commemorate comrades in flight, as well as other post-65 activities, have led to the Indian Wells, CA resident being chosen as the “Splendid Senior Among Us” for July 2007 in a national program initiated by Nashville, TN-based publishing company Pearlsong Press. In recent years Stanley, a retired Lt. Commander in the U.S. Naval Reserve, inspired and raised funds for the Wall of Honor and Walk of Honor at the Palm Springs Air Museum and the “A Wing and a Prayer” Missing Airman Monument at the Palm Springs International Airport. The Air Museum monuments, dedicated Nov. 11, 2004, pay homage to members of the Desert Fliers Command who have been awarded the Distinguished Flying Cross medal for heroism. The Missing Airman Monument, dedicated Nov. 11, 2006, was born from Stanley’s memories of his buddy Ken Henry of Oakland, CA, who was lost in combat off the coast of French Indochina during World War II. The “Eternal Light” on the wing tip of that monument is lit to serve as a beacon for all missing airmen to find their way home. “I am proud to know that the years I gave to have my phoenix’s rise allows me to put to rest the guilt as to ‘why them—why wasn’t it me?’” Stanley wrote Pearlsong Press founder Peggy Elam, Ph.D. after being notified of his recognition as a Splendid Senior. As Stanley nears his 88th birthday on August 9, he is working on yet another project: establishing the Air Medal Society (www.airmedal.org) to honor the airmen and women in past, present and future wars who have been (or are) awarded the Air Medal for distinguished achievement in flight. Stanley served in World War II and the Korean War. He joined his B-24 Squadron as a pilot in February 1944 and flew raids in the Marianas and Leyte. (His South Pacific Squadron was famously dubbed the “Blue Raiders” in a radio broadcast by Tokyo Rose.) He was awarded two Distinguished Flying Crosses, nine Air Medals, Fleet Commendation and the Presidential Citation as a result of his military service. After World War II Stanley worked for Pan American World Airways, flying routes from San Francisco to Japan. He also flew Constellations for World Airways out of Oakland. His trips to Japan exposed him to Asian cuisine, which so inspired him that he attended several Japanese cooking schools and continued his culinary education in other Asian and European schools. He apprenticed for Philippine Airlines Inflight Kitchen and the Manila Hotel, “where he perfected his cooking skills,” according to biographical notes at the Desert Flight Command website. In 1980, when he was in his 60s, Stanley was invited to attend the Hotel School at Lausanne, Switzerland, and later earned a spot in the kitchen of one of the world’s most famous restaurants, Fredy Giradet in Lausanne. His travels as a commercial pilot and experiences in the hospitality industry inspired Stanley to write and publish travel articles, stories and photos in several national and international publications. In 1992, when Stanley was in his 70s, he teamed with his wife, Pita Stanley, to form the East-West News Bureau (EWNB), a network of professional travel, food and wine writers, photographers and photojournalists around the globe. In 1999 the EWNB allied with the North American Travel Journalists Association and L’Organisation Mondiale de la Presse (OMPP) in Belgium to become the largest organization of professional journalists in the world. Stanley recently received a Certificate of Special Congressional Recognition from Congresswoman Mary Bono thanking him for his work on the “A Wing and a Prayer” monument as “a tremendous lifetime achievement.” He has also received several food-related awards, including the President’s Medal from his local chapter of the National Chef’s Association and Chef de Cuisine in 1992 and 1993. 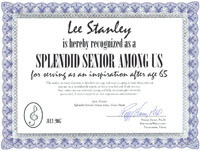 As the “Splendid Seniors Among Us” honoree for July 2007, Stanley receives a certificate and an autographed copy of Splendid Seniors: Great Lives, Great Deeds by Jack Adler, an original trade paperback published by Pearlsong Press in March 2007. Splendid Seniors celebrates 52 men and women throughout history who accomplished great things after age 65. Pearlsong Press is sponsoring the year-long “Splendid Seniors Among Us” program in conjunction with publication of Adler’s book in order to honor seniors who are living inspiration. 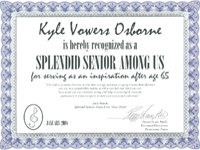 To nominate someone for the “Splendid Seniors Among Us” program, see the Pearlsong Press website. The book Splendid Seniors: Great Lives, Great Deeds can be purchased at Amazon.com and other online booksellers, as well as directly from Pearlsong Press. 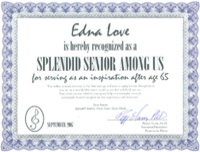 Marion, Virginia resident honored in national "Splendid Seniors Among Us" program recognizing people whose post-65 activities can inspire others at all life stages. 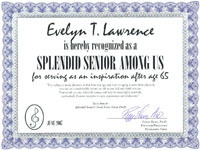 Pearlsong Press is honoring Evelyn Thompson Lawrence of Marion, Virginia as the "Splendid Senior Among Us" for June 2007. Lawrence retired as a primary school teacher in 1985, but now in her 80s still actively serves all ages through tireless community and church work. She continues writing and producing children’s plays and operettas, including a recent production with about 30 seven-year-olds celebrating Jamestown, Virginia's 400th anniversary. The town of Marion honored her last year by declaring July 22, 2006 the first "Evelyn Lawrence Day," and in May 2007 she spoke to the community during "An Evening with Evelyn Lawrence" hosted by the public library. “You know, as a black person, I’ve had all sorts of things that I had to overcome,” Lawrence says. "But no matter how much you lose, do the best you can with what you have. Stick with it -- good will come out of it." Lawrence serves as director of the project transforming the old Mt. Pleasant United Methodist Church building in the Historic District of Marion into an African American Museum. She was choir director and organist at the church for most of her life. "I was born into Mt. Pleasant," she laughs. Her maternal grandmother Sallie was one of the founders of the church. Sallie had been born into slavery. In the 1840s, when Sallie was five, her family was sold to a slave-owner in another county and she was sold to a Smyth County man who wanted a caregiver and companion for his ailing wife. Sallie coped with her pain and loneliness by sharing her tears with a big white oak tree in her owner’s yard. The tree the child wrapped her arms around is still standing, and has been honored as one of the Remarkable Trees of Viriginia. (See http://www.cnr.vt.edu/4H/remarkabletree/detail.cfm?AutofieldforPrimaryKey=1398 for a photo of Sallie’s Crying Tree.) Lawrence nominated her grandmother's Crying Tree for the honor. Lawrence taught in Marion's traditionally black Carnegie High School until that school was closed in 1965 when the public school system integrated. At that time she moved to Marion Primary School, where she was a popular teacher. She’s proud of the work she did at both schools, but many in the African American community are especially grateful for her influence at Carnegie. “I just wanted to see that our children had an opportunity to show their talent and be heard,” she says. As a local historian she compiled a book documenting every child who ever attended Carnegie High School, thereby saving a segment of history that might otherwise have been lost. She still coordinates regular Carnegie reunions, where alumni report that the loving attention given them by “Miss Thompson,” as she was then known, and the other Carnegie teachers prepared them to step confidently into and succeed in the larger world. After Mt. Pleasant United Methodist Church closed, Mrs. Lawrence joined both Grace United Methodist Church and Greenwood United Methodist Church. She plays the piano at Grace United Methodist, provides music for community weddings and funerals, and recently represented both churches as a delegate to the Holston Conference. She has served on the board of directors of Smyth County Community Hospital and has been chairperson of the Cultural Relations Committee of the Smyth County Branch of the American Association of University Women. 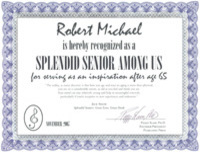 As the “Splendid Senior Among Us” honoree for June 2007, Lawrence receives a certificate and an autographed copy of Splendid Seniors: Great Lives, Great Deeds by Jack Adler (original trade paperback published by Pearlsong Press in March 2007). Pearlsong Press is sponsoring the year-long “Splendid Seniors Among Us” program in conjunction with publication of Adler’s book, to honor seniors who are living inspirations. For more information about the “Splendid Seniors Among Us” program, see the Pearlsong Press website at www.pearlsong.com.